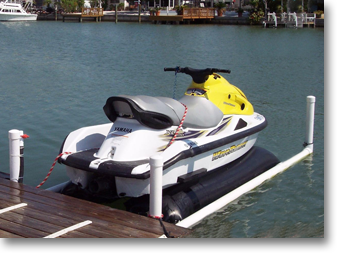 Dock your jet ski almost anywhere with the most VERSATILE and AFFORDABLE PWC Lift on the market!! 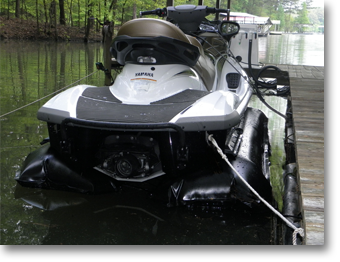 The Air-Dock PWC boat lift is extremely versatile. 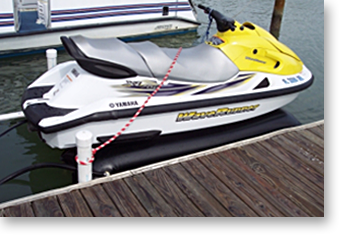 Use it with your personal water craft docked bow in or stern in. 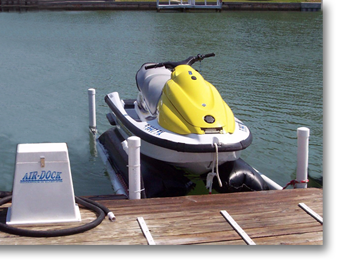 Use one PWC Air Control Box to operate on personal watercraft lift or multiple lifts. Very low pressure air will easily hoist our watercraft several inches above the water. With the Air-Dock mounted parallel to your dock, you can even drive the watercraft straight through it. To dock the PWC stern first, sit backwards on the seat and close the the handle bars. Then pull in with a rope. The two lifting air bags are connected with a rope which allows width adjustment. The space between the air bags allows water flow for the watercraft. The PWC model hoists the PWC several inches above the water and holds the PWC stable. The watercraft lift is approximately the same width as the PWC.